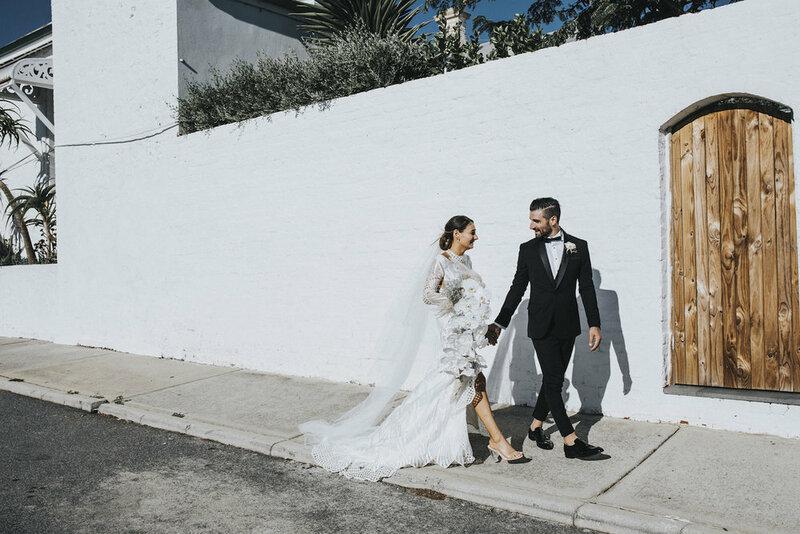 A eye melting dress by my girl Steph of By Kinsman, a traditional ceremony honouring family roots, an incredible reception nestled in the heart of the Art Gallery of Western Australia [topped with traditional Italian opera singers] - yeah, Daniel + Liana kinda nailed the whole 'let's do it our way' wedding. Liana, a style queen of note, with Daniel totally holding his own [see his pants below aka swoon] these two pulled together one sweet line-up of Perth folk. The balance of softness + structure, encompassing both their personalities, made for some stellar backdrops + scenes. Gown: By Kinsman // Crown: Lelet NY // Hair: Doowop Hair // MU: Whitney Andrews // Talons: Palette Nails // Suit: Politix // Bridesmaids: Bec & Bridge // Catering: Heyder & Shears // Ceremony St Patricks Basilica // Reception: Art Gallery of WA // Stationary: Nestle + Porter // Blooms: Natural Art Flowers // Furniture: Hire Society // Cake: Hello Sukar // Entertainment: DJ Shann // Lighting: Eighty Eight Events // Favours: Shylo Concrete Homewears.